Movie review: “Mary and the Witch’s Flower” is a gentle, sweet story, told with painterly artistry; it’s a joy to look at. Rating: 3 stars out of 4. After the legendary Japanese animator Hayao Miyazaki’s retirement a few years ago (luckily, it didn’t seem to take; he announced plans for a new film in 2017), many wondered who would pick up the mantle of his longtime production house, Studio Ghibli. “Mary and the Witch’s Flower,” the first feature from the newly formed Studio Ponoc, provides a charming answer. Directed by Hiromasa Yonebayashi, who worked for 20 years at Studio Ghibli on films including “Princess Mononoke” and “Spirited Away,” it follows Miyazaki’s creative path: a gentle, sweet story, told with painterly artistry. 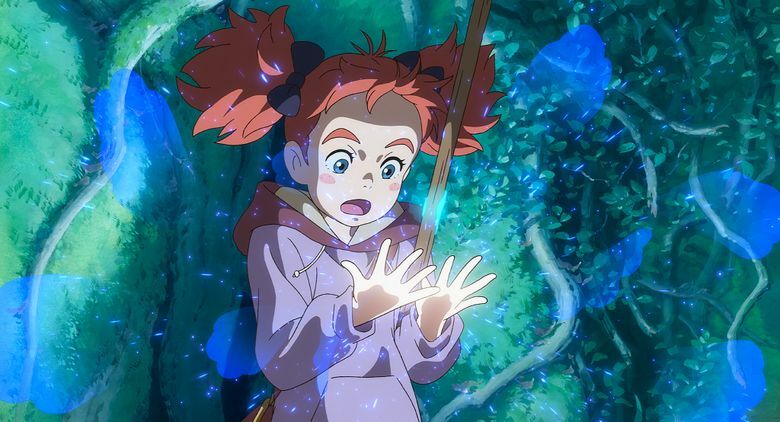 “Mary and the Witch’s Flower,” a tale of a little girl (voiced by Ruby Barnhill in the dubbed version I saw; a subtitled version is also screening) who is transported to a school for witches, might seem to be following another, Hogwarts-ish path. But this story predates “Harry Potter” by several decades: It’s based on British author Mary Stewart’s “The Little Broomstick,” a 1971 children’s novel. Mary, the main character, has been sent to live with her great-aunt Charlotte while her parents are away. Bored and a little lonely, she wanders the grounds of her aunt’s estate and finds magic in the form of a glittering blue flower and a broomstick. Just like that, she’s at Endor College — but what initially seems like an enchanted place soon begins to darken. The filmmakers are clearly aware of the Potter angle, and have a little fun with it; in one brief scene, we see a boy in round glasses struggling to mount a broomstick. (Mary, of course, is a natural.) But what stays with you after this movie — like Miyazaki’s films — is not so much what happens, but the way the story is told in pictures. Yonebayashi gives us a picturebook English estate, surrounded by lush forests and Impressionist-worthy flowers, under moody blue-and-violet skies and cottony mists. A wary-eyed cat, who becomes Mary’s co-conspirator, pads through the grass with stealthy softness. The roller-coaster broomstick rides are both harrowing and enticing — every kid watching this will head straight for the broom closet at home — and the strange creatures Mary discovers at Endor are creepily odd without being nightmare-scary. ‘Mary and the Witch’s Flower,’ with the voices of Ruby Barnhill, Kate Winslet, Jim Broadbent, Ewen Bremner. Directed by Hiromasa Yonebayashi, from a screenplay by Riko Sakaguchi and Yonebayashi, based on the novel “The Little Broomstick” by Mary Stewart. 103 minutes. Rated PG from some action and thematic elements. Several theaters; all screenings are of the dubbed-in-English version except for the last screening of each day, which will be in Japanese and subtitled in English. “Mary and the Witch’s Flower” isn’t quite a masterpiece; the ending is strangely abrupt, and the screenplay needs a polish. (Mary, far too often, just repeats what’s last said to her, in a questioning voice.) But it’s a joy to look at: a visual adventure, and a continuation of a remarkable legacy.